Today we visited the 2015 Sculptures by the Sea with Irwyn, Les and Lori. We met Lori, Les and Irwyn at Central. These C Set trains came into service in 1986. We join the masses at the start of S by the S at Bondi. Ben Fasham, 'bjf13', Sculpture by the Sea, Bondi 2015. Matt Calvert, 'TheNavigator', Sculpture by the Sea, Bondi 2015. Elyssa Sykes-Smith, 'Cradle of Form', Sculpture by the Sea, Bondi 2015. Michael Van Dam, 'Intervention (2014)', Sculpture by the Sea, Bondi 2015. Andrea Vinkovic, 'Intuitive Sense of Connection', Sculpture by the Sea, Bondi 2015. Jimmy Rix, 'Troubled Youth', Sculpture by the Sea, Bondi 2015. David McCracken, 'Incendiary', Sculpture by the Sea, Bondi 2015. Lynn getting into the picture. Looking back, they still come. Gao Xiaowu, 'City Dreams', Sculpture by the Sea, Bondi 2015. And we are followed by 20 zillion school kids. Seung-Hwan Kim, 'Meditation 2015 #1', Sculpture by the Sea, Bondi 2015. Zac Benson, 'Conspicuous Consumption', Sculpture by the Sea, Bondi 2015. Part of the top level which we missed last year. Zilvinas Kempinas, 'Kakashi (2012)' , Sculpture by the Sea, Bondi 2015. Kathleen Berney, 'Minden Jó Lesz 1953 (all shall be well)', Sculpture by the Sea. Gillie Schattner, 'Flying Fish', Sculpture by the Sea, Bondi 2015. 'Enjoying The View' by Resta Bottom. Caitlin Roseby, 'Half Gate', Sculpture by the Sea. Linda Bowden, 'The Bridge', Sculpture by the Sea, Bondi 2015. Peter Lundberg, 'Open', Sculpture by the Sea, Bondi 2015. Jörg Plickat, 'Divided Planet', Sculpture by the Sea, Bondi 2015. William Feuerman, 'Outside-in', Sculpture by the Sea. Wang Shugang, 'Man on Ball', Sculpture by the Sea, Bondi 2015. Orest Keywan, 'And The Ship Sails On (with apologies to f.f.)' , Sculpture by the Sea. Sculpture by the Sea, Bondi 2015. Sandra Pitkin, 'Keep Safe/Keepsafe', Sculpture by the Sea, Bondi 2015. Harrie Fasher, 'Boxed', Sculpture by the Sea, Bondi 2015. Dropping a block of flats into place, plus 'Man on Phone' by Needto Makeacall. James Rogers, 'Surfer’s Paradise', Sculpture by the Sea, Bondi 2015. Enjoying James Rogers' 'Surfer’s Paradise', Sculpture by the Sea. Sandra Cross, 'Dissolution III', Sculpture by the Sea, Bondi. Clayton Thompson, 'Space Time Continuum v4', Sculpture by the Sea, Bondi 2015. Thomas Quayle, 'Messages From The West', Sculpture by the Sea, Bondi. Cameron Stanton, 'Charged' , Sculpture by the Sea, Bondi 2015. Margarita Sampson, 'Voyagers I & II', Sculpture by the Sea. My friends liked this one. Stephen Harrison, 'Hamlet’s Lament', Sculpture by the Sea, Bondi. Yolande Rose, 'Lithoid' , Sculpture by the Sea. Trevor Mahovsky, 'Picnic' , Sculpture by the Sea, Bondi 2015. Fabio Pietrantonio, 'Quotidianity “the brothers” '(2013), Sculpture by the Sea, Bondi 2015. Lubomir Mikle, 'P.O.P.' 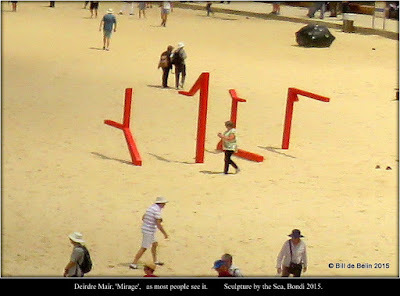 , Sculpture by the Sea, Bondi 2015. Michael Purdy, 'Kings and Queens', Sculpture by the Sea, Bondi 2015. Chen Wenling, 'Harbour', Sculpture by the Sea, Bondi 2015. Benjamin Storch, 'Undulation', Sculpture by the Sea, Bondi 2015. 'Lady in Purple' by Goda Getcloser. Deborah Sleeman, 'Forest', Sculpture by the Sea, Bondi 2015. Tim Macfarlane Reid, 'Still Connected', Sculpture by the Sea. Arissara Reed, 'Acoustic Chamber', Sculpture by the Sea, Bondi 2015. 'People in a Hurry' by Q Uick Theresawavecoming. Naidee Changmoh, 'Fun! ', Sculpture by the Sea, Bondi 2015. Ruth Liou, 'The Bell', Sculpture by the Sea, Bondi 2015. Kate Carroll, 'Open Home', Sculpture by the Sea, Bondi 2015. Koichi Ishino, 'Wind Blowing', Sculpture by the Sea, Bondi 2015. Harry Vasutabu, 'Anenome', Sculpture by the Sea, Bondi 2015. Overview of part of the walk. Laurence Edwards, 'Crouching Man', Sculpture by the Sea, Bondi 2015. I'm starting to get a headache with all these people around. Sculpture by sticks by the sea. Louis Pratt, 'King Coal', Sculpture by the Sea, Bondi 2015. Jeremy Sheehan, 'Transmigration', Sculpture by the Sea, Bondi 2015. Alessandra Rossi, 'Crate Poem', Sculpture by the Sea, Bondi 2015. Elaine Miles, 'Tidalpools #3', Sculpture by the Sea, Bondi 2015. Norton Flavel, 'Dust', Sculpture by the Sea, Bondi 2015. 'Blue Shirt' by I B E T I M The First. Annette Thas, 'Wave 2', Sculpture by the Sea, Bondi 2015. Deirdre Mair, 'Mirage', As most people see it. Deirdre Mair, 'Mirage', From a different angle. Alwin Reamillo, Bayabihan hopping spirit house, Sculpture by the Sea, Bondi 2015. 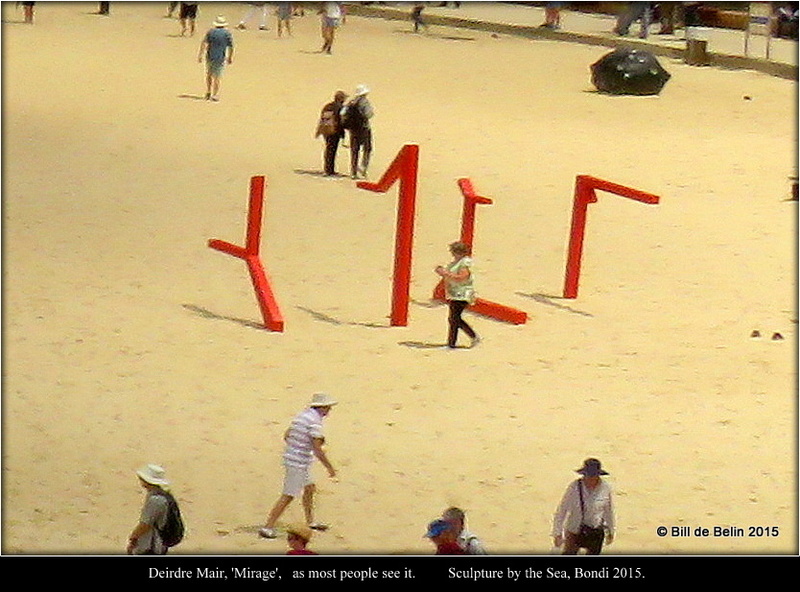 Mano Ponnambalam, 'Repetitive Structures', Sculpture by the Sea, Bondi 2015. TaeGeun Yang, 'Pig of Fortune #2', Sculpture by the Sea, Bondi 2015. 'Ladies in Red and White Hats' by Hey Thatsmycamera. Michael Le Grand, 'Recoil', Sculpture by the Sea. Geraldo Zamproni, 'Volatile Structure VII', Sculpture by the Sea, Bondi 2015. "What in the hell's he doing over there?" "Governor Bligh" Harbour Master Pilot Service's Boat. Keizo Ushio, 'Oushi Zokei', Sculpture by the Sea. every man is not the same' Elton John. These people have lived here too long, their main chairs face the house, not the ocean view. Les leads the way up the sandstone cutting on South Bronte hill. about 1910 with trams begin running to Bronte in 1911. Part of the Bondi to Coogee Coastal Walk goes past Waverley Cemetery. Part of the Bondi to Coogee Coastal Walk. Looking back from Waverley Cemetery to Bondi Beach. The bus we caught from Clovelly was packed going back to Central.